NOTE: Do not use this method with a Schmit Cassegrain Scope SCT! Or any other telescope with a moving primary. I call this procedure the P Squared Method. A telescope in a shop or home has plenty of flat walls to project the laser onto. Observatories are a different matter, domes are round, roll off roof may have short walls, things are in the way etc. So all you do is point the scope to the floor and look at your laser image from there. Just level you RA counter weight bar with a level, then make your optical tube vertical with a level and stop tracking or shut down you telescope mount. Insert laser and use whatever system you are used to. These images are with my homemade laser collimator with one ring and one center dot which of course is hitting the secondary. One laser does two jobs! 1st pic - Laser in scope. 2nd pic -Laser pattern off mirrors on my template. Spider veins lined up nicely, Black Square is my Iphone while taking picture. 3rd pic - Laser shooting from focuser and just passing secondary. -There is less stress on the whole optical system pointing downward from tube flexure, mirror bolt drop etc. 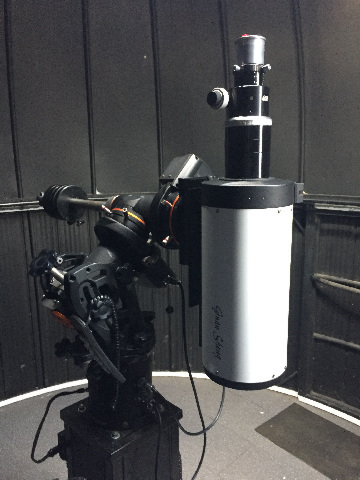 -If you loosen all the lock screws on the back of the telescope your mirror will self center itself because it is hanging on the mirror adjustment screws. -The laser will be using gravity to hold it in your focuser so there is no need or use the tiniest amount of pressure on the thumb screws. This is a more repeatable way of installing the laser compared to one that is installed in a horizontal focuser. 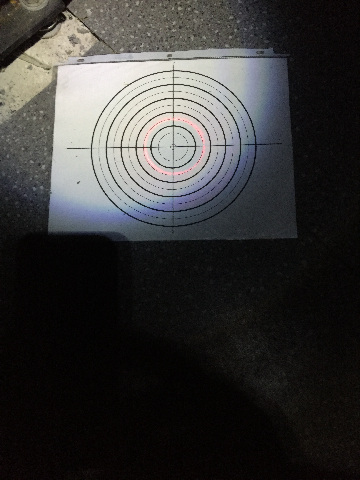 -You can spin your focuser on top of the telescope to see if the laser spot stays at the same spot on your secondary. Adjust focuser tilt if needed. 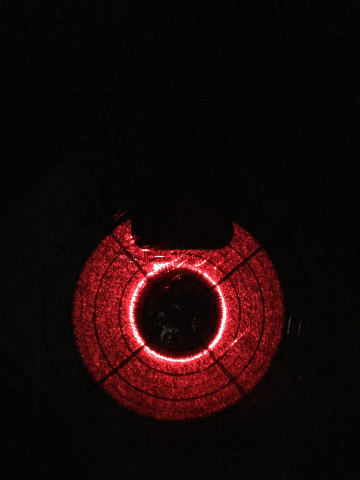 -I feel that by looking at the laser rings from three-five positions (the fourth would be where the telescope mount is so can’t do that but you can get close you get the fourth and fifth position either side of mount) on the floor give me a better idea on how concentric the image is vs looking at it on a wall. You will be surprised how good it looks but then go to the other side and you go hmmmm that doesn`t look quite right. This is because you’re viewing the image on a angle. The only drawback is it may be a little tuff to adjust the secondary screws but with a chair close by it makes it a lot easier. You may even have to lie on the floor to make adjustments depending on mount height and tube length.